The only prerequisite for this tutorial is a VPS with Ubuntu 13.10 x64 installed. Note that HHVM doesn't support any 32 bit operating system and they have no plans to add support for 32 bit operating systems. Use SSH to access the droplet. HipHop Virtual Machine (HHVM) is a virtual machine developed and open sourced by Facebook to process and execute programs and scripts written in PHP. Facebook developed HHVM because the regular Zend+Apache combination isn't as efficient to serve large applications built in PHP. This will create a file named hello_world.php and allow you to enter its contents. Type in (or copy and paste) the following code and then press Ctrl + D to save the file. Note: If you are familiar with editors like nano or vim, you can use those to create and save this file. This will create a file named hello.php in the public directory and allow you to enter its contents. Type in (or copy and paste) the following code and then press Ctrl + D to save the file. Note: Replace 128.199.212.7 with the IP address or domain name used by your droplet. This command will stop Apache and free up port 80 for HHVM to use. 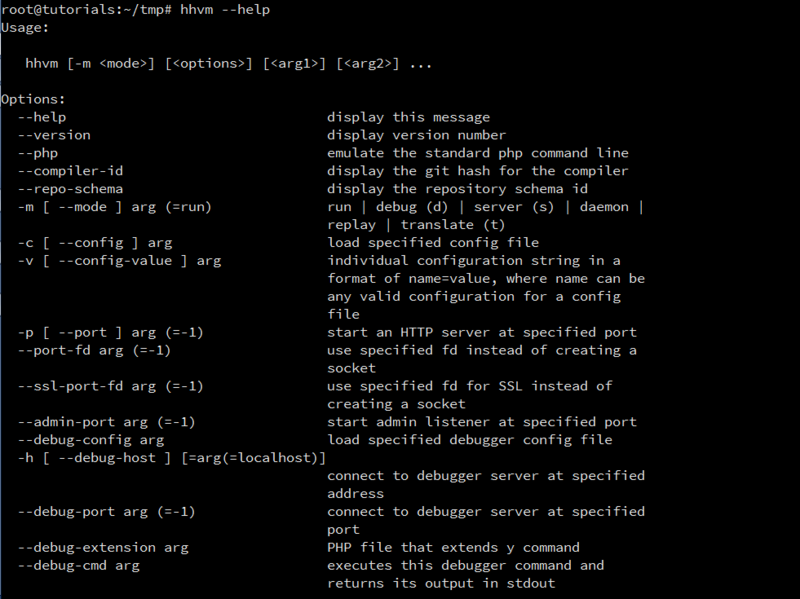 The next step is to start the HHVM server in the root directory of your PHP application. The most common location of this root directory on Ubuntu is /var/www. This command will start the HHVM server, which will begin serving your PHP application from the current directory. Starting with version 3.0, HHVM can no longer be used in the server mode. This section will help you configure HHVM in the FastCGI mode with the Apache and Nginx servers. Running this script configures Apache to start using HHVM to process the PHP code. It'll also restart the Apache server so you don't have to do anything else. Executing this script configures Nginx to start using HHVM to process the PHP code. It'll also restart the Nginx server so you don't have to do anything else. After you have configured your server to start using HHVM, it's always a good idea to confirm that the server (Apache or Nginx) is indeed using HHVM to process PHP. If you have reached this far, you are now well equipped to start using HHVM to serve your PHP based websites. Being several times more efficient than the regular Zend PHP engine + APC combination, HHVM can help you serve a lot more visitors to your website with much lower hardware requirements!